Question time. Who’s in the house? Airbus Helicopters, that’s who! As the main political parties gear up for a hard fought election campaign, we have been developing another kind of campaign, one aimed at the current Members of Parliament and readers of the House of Commons magazine ‘House’. We have developed our long standing Airbus Helicopters global advertising concept with rotating copy messages to run as a continuous campaign into the summer. This is the only time the campaign has been tailored for a UK audience, the first being a year ago to announce the rebranded business on its relaunch as Airbus Helicopters instead of Eurocopter. The aim of this ‘political advertising campaign’ being to inform MPs and a wider political audience with the message that Airbus Helicopters are the preferred choice of helicopters in the UK for use on police, air ambulance, business and oil & gas ‘missions’. Airbus Helicopters also provide rotary wing aircraft and associated engineering services for a number of key UK MOD military support platforms including training aircraft the Puma 2 upgrades. The ‘honey I shrunk the Earth’ image that was premiered for the original service advertising motif has been remodelled a little with an exaggerated relief globe and a clear focus on the UK. To view our advertising portfolio, including more about this political advertising campaign, please click here. 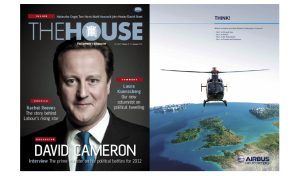 To view other campaigns we have delivered for Airbus Helicopters please click here.